When I started using R, about ten years ago, the community was much smaller. No R-bloggers to get inspired or ggplot2 to make nice graphs. It was the beginning of an other implementation of R (other than CRAN’s) known as Revolution R from Revolution Analytics. Their R targeted enterprise and was designed to be faster and more scalable. They also offer an open source version of their product called RRO. In April 2015, the company was acquired by Microsoft! May be this means, that at some point, everybody will be able to do R in Excel (instead of using Visual Basics)… We’ll see! Meanwhile, I decided to try RRO, now MRO (Microsoft R Open) and see if I could get higher performance on the day-to-day analyses I do. A benchmark is available (results and code) on their website to show exactly what you can gain from their multithreaded implementation. I decided to test it anyway even if those operations were not the ones I used most frequently. So I set up my own little benchmark. I did so using an R Markdown file to have the results nicely put in an HTML document (other possible outputs are pdf and Word formats). I ran my benchmark using MRO 3.2.3 and CRAN’s R 3.2.2. I ran it on my desktop computer with 4 cores. The html outputs can be found here. 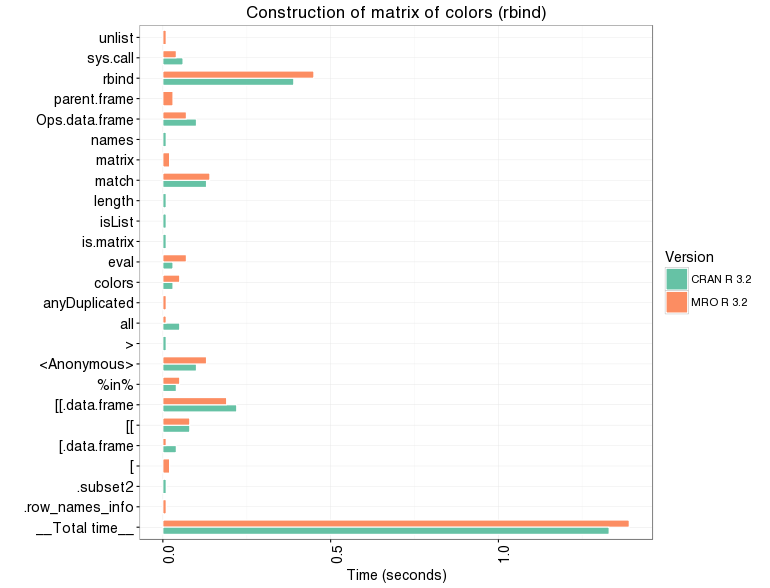 Remember the post I did about python and how to know which piece of code is the fastest? We can do the same in R! The first two columns are the ones we want to look at, self.time and self.pct. They are respectively the time in seconds and the percentage of total time spent executing the code of the stated function. In my output, you can see all the steps that are done in order to do a principal component analysis and the time and memory used by each step. For quick operations, you can set a number of replications and iterations in order to get a reasonable idea. In the output above, you can see that prcomp uses the any and as.matrix functions and that they are quite fast while %*% and La.svd are the most costly steps. To get the total amount of time, we can sum the self.time column. Here are some the results for the comparison of R and MRO. 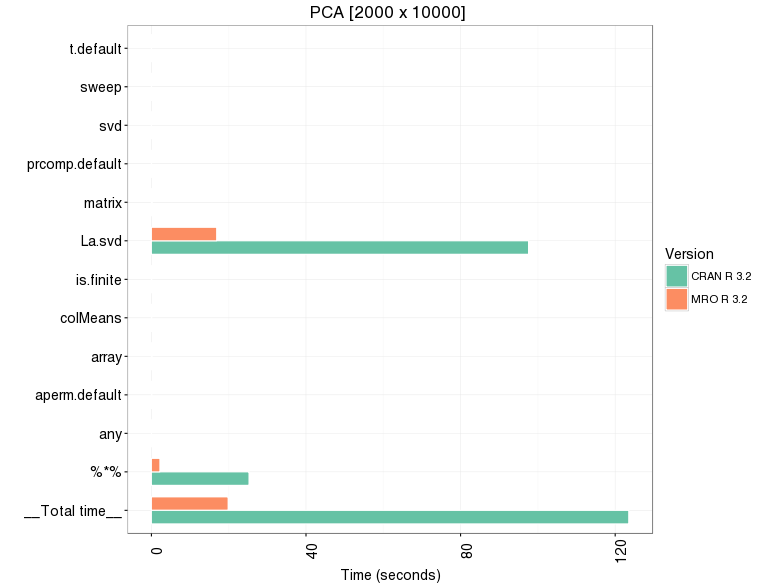 Taking the example provided on Revolution website, MRO is clearly the fastest at doing PCA (27.8 vs 129.3 seconds) on a 2000 x 10,000 matrix but it's less clear when I use my own example of 66 x 137,032 (2.02 vs 2.26 seconds). As for other operations, they do not benefits from the parallel architecture. In fact, according to MRO people, linear regression and cross product as well as determinant computation and Cholesky decomposition benefits the most from the multithreaded operations. As expected, creation/manipulation/transformation of matrices as well as loops and recursion get no gain. Indeed, these operations are not really parallelism-friendly. Interestingly, with the profiler, we can see that when constructing a matrix using a for loop, rbind and a condition (for example, having blue if the value is greater than 4 else black), both implementations do not use the same internal methods.